Have you heard about the Frostbite Indiegogo campaign? You probably know I'm a huge fan of Richelle Mead's Vampire Academy novels and an even bigger fan of the spinoff series Bloodlines, which I'm always gushing about! So, of course, once I heard that they were crowd funding for a sequel to this year's Vampire Academy movie I had to contribute! I know there was a whole thing with the VA movie where a lot of fans of the series refused to see it in the theaters, which I don't get because I really enjoyed the movie. I thought it stuck very closely to the book and the characters were spot on. So hopefully, now that the DVD has had time to come out, more people will have seen the movie and will show there support for a Frostbite movie. Have you seen the Vampire Academy movie? Did you love it or hate it? 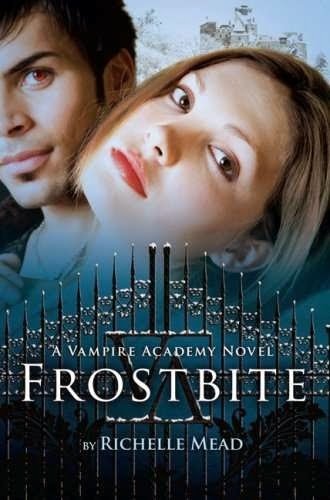 If you've read the VA novels than you know that Adrian shows up for the first time in Frostbite (as well as Eddie, since he was cut from the first movie) and this is a BIG DEAL. Adrian is my top, top, top book crush of all time. He's half of one of the greatest romances ever (if you've read Silver Shadows you probably agree with this statement). And he's so, so, SO cute. Well, in my head, at least. He hasn't been cast yet and together we could make that happen! So, if you love Vampire Academy (Bloodlines, Adrian, Dimitri, Rose, whoever) and haven't already, go check out the Indiegogo campaign and see if there's a perk for you and help make this movie a reality. They have a ton of awesome perks, most of which aren't very expensive. Things like signed cast photos, a signed picture of Adrian once he's officially cast (!!!!!! ), digital downloads, official film scripts, hoodies and t-shirts to show your support. If you're willing to spend the big bucks there's even a walk on roll (with lines!) to be had. Plus there's this awesome video and I wholeheartedly agree with the sentiment at the end. We could make Adrian more than just a dream! Contribute to make Frostbite happen! I would go crazy if they made a Bloodlines movie. It's got so much to offer the world with all it's magic and witches and Sydrian! But for whatever reason this series is struggling to get going, which doesn't give me any sort of hope. It's sad, because there is some serious potential there. And even if they do get the movies on track, 6 movies is a super long franchise, and then another six for the spinoff... Yeah, it crushes me to think that I'll probably never see Sydrian on the big screen. Maybe VA would have done better as a TV show? I have not seen the film, but I have not heard many bad things about it. Most of the negative things I have heard are from the idiots who have not seen it and are just going by the trailer. The only thing I am not a fan of is the fact that the director shared some not so good opinions on the project, basically saying he wished he didnt do it. I didn't know he director did that. That's awful. I get it sort of bombed in the movies, but that's no reason to be negative about something. A lot of movies that do poorly but their directors love the project? Those are the movies that end up doing well in the long run. It's like everything went wrong for VA from the beginning, with people deciding not to watch based on the trailer, critics attacking it just cause, then they were pushing back release dates too? Ugh. I really hope the people working on Frostbite love the project (which they seem to if you read the Indiegogo campaign) and make this work. The series deserves a second chance. I love the VA books so much (more than Bloodlines, actually), but the movie was really... off, and I just laughed during the whole thing. I'd still really like to watch a Frostbite movie, mostly because I want to support everything VA-related. :D And Adrian, duh. Eddie, too! I agree that the movie could have been a little more serious. I enjoyed it, but it was far from perfect. But then again, I wasn't the biggest fan of the first book. I really liked it by the end, but I've always thought the first VA book is, I don't know, sillier than the others in a way. Maybe because it's very high school, which is how I felt about the movie. It was more focused on normal high school drama than anything really supernatural. But, yeah. I'm hoping they really get the series going in Frostbite, so I hope that it's able to be produced. I haven't seen the movie yet -- though I want to. From the marketing, it seemed like they focused too much on the "vampires at boarding school" aspect of the story and completely missed all the others. Hope this movie gets made and that they find a director who loves the books!